We’ve been trying out some different ways to cook our chicken, please select from the drop down list. Here’s the first one we tried…. This is a lovely summer recipe. 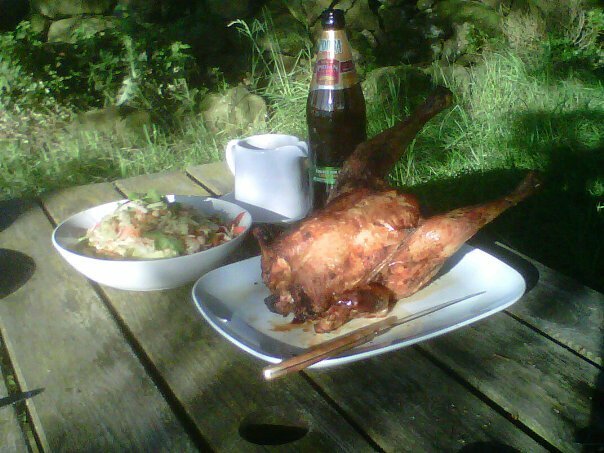 I cooked my beer can chicken in the oven but if you have a Webber style barbeque with a lid then you could cook up a storm on that. In a food processor blend the ginger & garlic to a paste, add juice, oil, spices and salt. Loosen the skin of the chicken by gently pushing your fingers between skin and breast meat. Put chicken into bag along with paste & massage. Leave to marinade for at least 3 hours or overnight. When ready to cook, take your can of beer and pour a good third out. Take an roasting tray and put the can on it. Remove the chicken from the bag and position it on top of the can insering it into the leg end cavity. This takes a bit of jigging about to get steady. Put in oven at 200C for about 20 mins then drop temp to 180C for another 50 mins or so. Once ready take out oven, carefully remove can and leave to chicken to rest for about 10 mins or so. If you would like a sauce then put roasting tray on top of stove turn up heat, empty any juices from the can and maybe a little water, scrape up the bits of sediment and boil until desired strenghth. Strain into a saucepan, add tablespoon or so of mango chutney and stir in. Adjust the seasoning. I used Indian beer in a bottle but poured it into a clean cola can. You can buy a beer can chicken roaster in John Lewis which makes it much steadier & Webber have one as an accessory. If you don’t want alcohol then substitute with cola or another soft drink. To assemble mix all salad ingredients together in a bowl. Taste dressing and adjust seasoning etc, pour over salad, toss well. Put into seving bowl, sprinkle with toasted seeds and some fresh coriander and or mint leaves. Looking good , will be sure to try it out soon. Very diplomatic ‘ leg end cavity ‘ hehe.